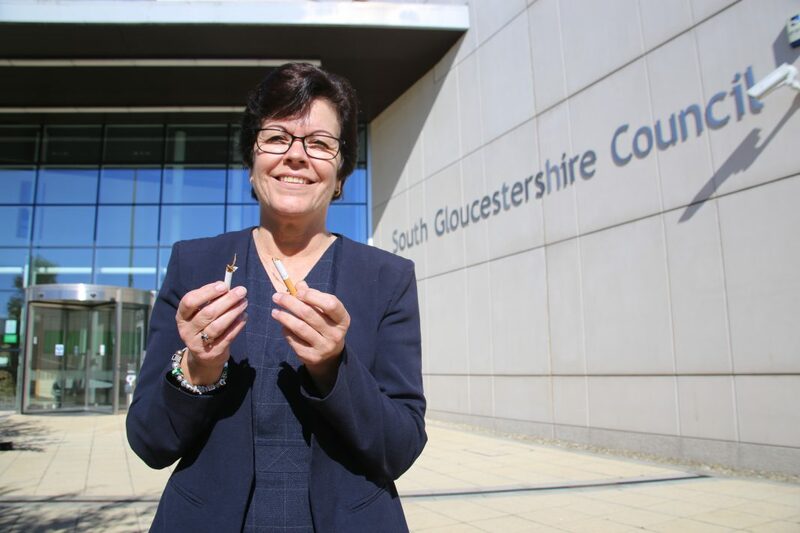 South Gloucestershire Council’s Cabinet Member for Housing Delivery and Public Health Cllr Erica Williams is taking part in Stoptober by quitting cigarettes. Councillor Williams has responsibility for promoting positive health choices, so this October, Erica is putting her money where her mouth is and taking part in Stoptober attempting to give up smoking for good. Cllr Williams said: “The main reason I wanted to be involved in Stoptober is that with my new portfolio for public health, I want to be seen to lead the way and hopefully motivate others to quit. I can then speak from a position of personal experience, showing that whilst hard, it is possible to give up for good. I’m getting sponsored to give up, raising money for the Lullaby Trust, and the money that I’ll save not buying cigarettes in the future can be spent on my family. “I didn’t smoke at all during the pregnancies for my children and I did manage to quit for a year once before, but then slipped back into the habit. What’s different this time is that I really want to quit and I’ll have a great deal of help behind me. Stopping smoking is the best thing a smoker can do for their health and Stoptober is there to help smokers on their quitting journey for 28 days. There are many different types of stop smoking support available, so it can be difficult for a smoker to know what will work best for them. Stoptober’s free online Personal Quit Plan helps smokers find the support that is right for them based on their level of tobacco dependency and what quitting support they have previously used. The new, free online tool, accessed through the Stoptober website, will help smokers to find the right combination of support for them – with options including face-to-face support, nicotine replacement therapies (NRT) like patches, gum or inhalers, and e-cigarettes – offering a personalised quit journey. • Using a stop smoking medication will make you twice as likely quit successfully.